Do you feel that 20% of what you & your employees deliver accounts for 80% of the value needed to scale your business? This figure is the norm; it means 80% of the work done in most businesses is waste. Is your business executing your strategy to the level you expect? Are your people objectives aligned to your strategic objectives? Is the team fully engaged and focused on executing the most important tasks? Are you a ‘first things first’ kind of an organization? One common challenge that quietly sneaks up on successful growth companies is the subtle transition from excellent, precise execution to passivity, complacency and eventually poor execution disciplines. Jeff Sutherland wrote: “The people who multitask the most just can’t focus.” Welcome to Scrum the art of doing twice the work (value driven work) in half the time. By simply tightening up your execution habits, and aggressively addressing ‘Urgent Important, Non Urgent Important …’ better known as Eisenhower’s matrix of blah blah blah, you can dramatically move the needle from 20% and improve gross margins and profitability whilst improving ‘velocity’ and focus. Jim Collins wrote: “Greatness is not a function of circumstance. Greatness, it turns out, is largely a matter of conscious choice, and discipline,” and there are 10 habits all leaders must get right to work ‘ON’ the business and not ‘IN’ the business. Is there a clear alignment between your employee’ objectives and your strategic objectives? Do you suffer from the Tower of Babel effect whereby people & teams do not communicate effectively? Are people complaining of too many things to do and no time to get them done, right? Are you growing so fast you are at risk of the wheels coming off? Or is it simply that strategy and execution live two totally different realities? There are 10 fundamental habits that support the successful execution of your strategy, habits that haven’t changed for the 100 years since John D. Rockefeller implemented them in becoming the wealthiest person ever and building what has morphed into one of the largest companies today. ExxonMobil. The Rockefeller Habits checklist will dramatically increase profitability and reduce the time it takes to manage the business. And like the checklists that are critical to the airline industry in making sure its planes stay in the air, consider these 10 habits as a “pre- flight” checklist for keeping your company growing and not stalling. Turn strategic vision into action. Times are a-Changing, and the pace of change is accelerating into the exponential. Companies & CEOs Lifecycles have halved. Adapt or Die. Do you still rely on your 5-year plans? Is the annual budgeting cycle still valid? Are you managing through the chaos of what we now call VUCA? Volatility, Uncertainty, Complexity and Ambiguity, is the new norm, and new rules of strategic planning and execution are needed to win. Are you finding it hard to adapt and win? Are the tools and systems that helped you win no longer fueling growth? Are your teams living in silos? Is decision taking painfully slow compared to your competitors? Is your Innovation and New Product Development producing ‘great stuff’ nobody wants to buy? Welcome to Management 3.0. Where agile, adaptive systems and people flourish, and 90 day strategic sprints rule the waves! Agile is Scrum and Scrum has its origins in Toyota’s lean management. Scrum combines the essence of kaizen (continous improvement) with agile management to create teams that are autonomous, masterful and purposeful, geared to manage through the chaos of today’s disruptive economic reality. Scrum attacks VUCA full on. The result of over 20 years’ incubation, mostly it must be said in the software development industry, it has recently gained momentum as the only tried and tested framework that CEOs can apply to win. It works well for any complex, innovative scope of work. We are using it in bottling plants, facilities & building management, manufacturing and traders. The possibilities are endless. We have empirical data showing how the very best teams have achieved a 700X increase in productivity. Let me repeat that. The very best teams have applied Scrum and improved their productivity by 700X! The Scrum framework is deceptively simple to implement but needs discipline, focus and agile leadership, plus an experienced coach to keep you on-track. Ed has over 20 years’ experience in Toyota Quality Management principles of management and is part of the core team at Agile ME bringing these disciplines to the Levant and Middle East. Twice the work, in half the time. A systematic approach that supports the ‘culture eats strategy for breakfast’ ethos of companies like Urbanise, Google and countless other high growth companies. A special few are applying ‘velocity’ the core Scrum metric to managing the performance of their CEO and his/ her Senior Management Team…the possibilities of what you can achieve are endless…. Is everyone focused and disciplined on doing the right things first? Is everyone on the same page? Are people working in silos? Is effort focused and do goals ensure cross-functional alignment? Can anyone see real-time progress against the top priorities? Is the important work visible? Do you sometime feel you as a company are going nowhere fast? Have you a disciplined goal setting process? Do goals stretch people? Given the choice how likely are you to recommend your existing performance management system to a colleague? 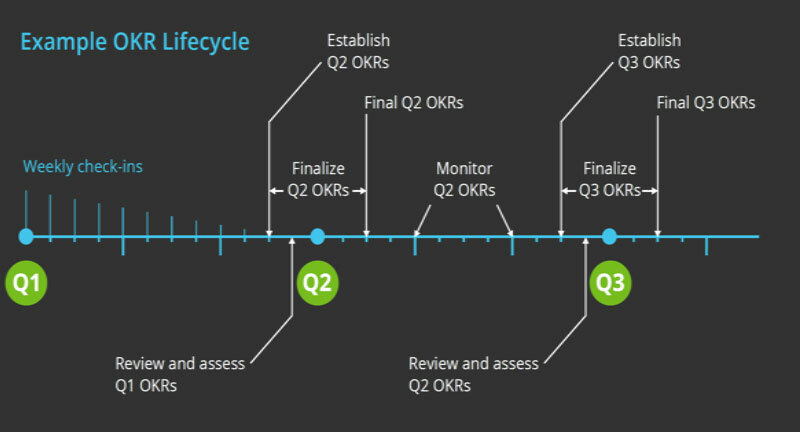 The OKR framework accelerates how fast and how effectively your company turns its vision into action. OKRs help your company focus efforts on the same important issues throughout the organization, and because they are visible to everyone, and we mean everyone, OKRs help everyone work toward the same results. When applied to Strategic Scrum the results are phenomenal, a key element to accelerated states of happiness and performance. An Objective is something that must be accomplished by the company and an individual. Objectives must create stretch; they should make you feel uncomfortable. For every Objective there will be 3-5 Key Results. Key Results are the ‘definition of done’ for ensuring an objective has been accomplished, and they describe outcomes, not activities. Clearly align employee’ objectives and strategic objectives setting. Accurate cross functional, cross company communications, no BS required. Let everyone know what is important and pushes teams towards operational excellence under SCRUM thus supporting the essence of high performing teams. Autonomy, Mastery & Purposefulness.